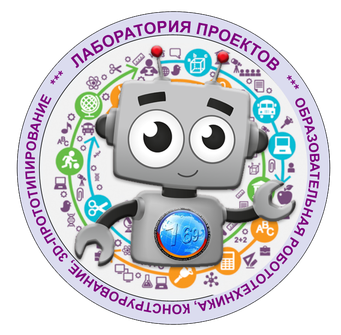 ability to use global and local variables and function parameters of arbitrary type, including arrays. Attention! 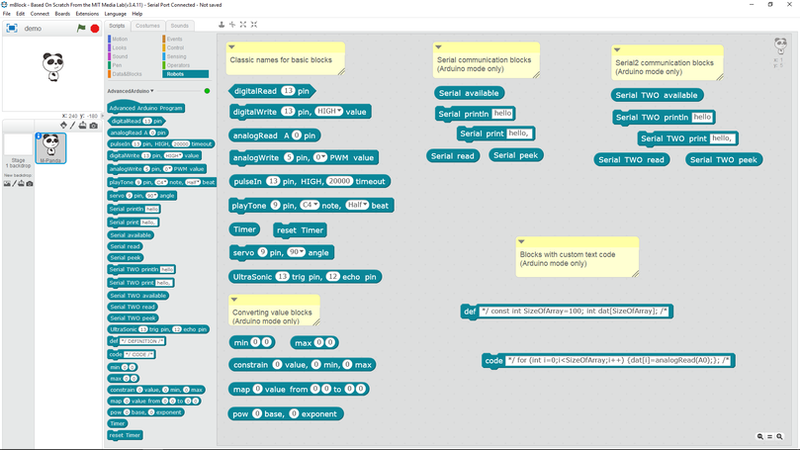 The mBlock visual programming environment generates the Arduino code sketch using the "double" type for all variables and function parameters created in the visual mode. Do not forget, if necessary, cast the value to another type - int (), byte (), String (). Run mBlock and select Extensions -> Manage Extensions from the menu. 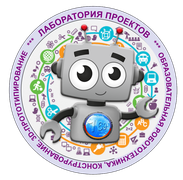 The extension list will be downloaded from MakeBlock website. Type "AdvancedArduino" in the "Search" field. You will see the "AdvancedArduino" element on the list. Click on the "Download" button of the "AdvancedArduino" element. Download or copy "AdvancedArduino.zip" file to your computer. Run mBlock and select Extensions -> Manage Extensions from the menu, then click on the "Add Extension" button. Select the file type "zip-file", scroll to the downloaded archive, then click on the "Open" button. 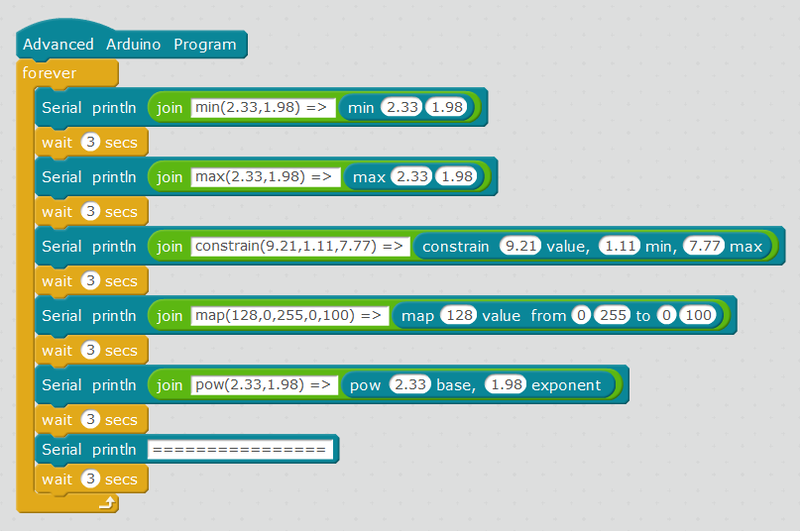 Blocks with custom code snippets ("Wire" programming language) in a graphical script. Attention! 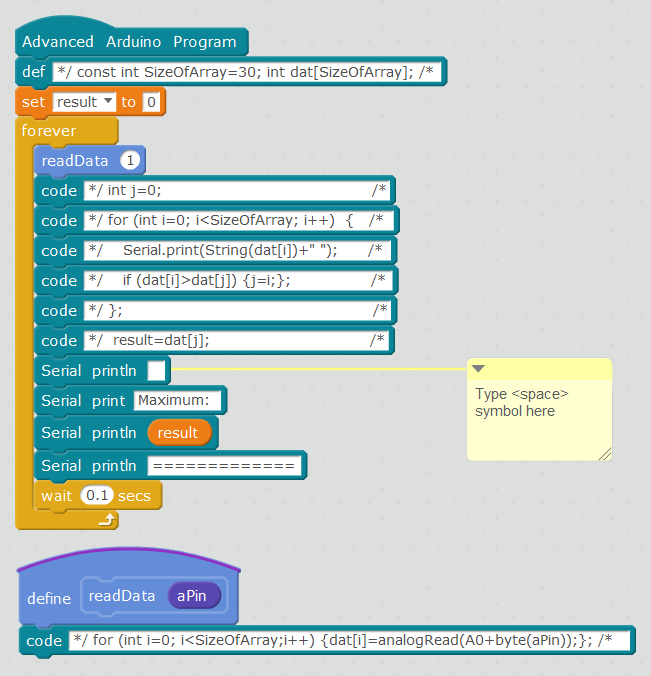 When mBlock generates Arduino code sketch it comments out the code () and def () block values using the /* and */ directives. To make the code fragment visible to the compiler, it is necessary to put the CLOSE "bracket" ( */ ) in the BEGINNING, and the OPEN “bracket” ( /* ) at the END. 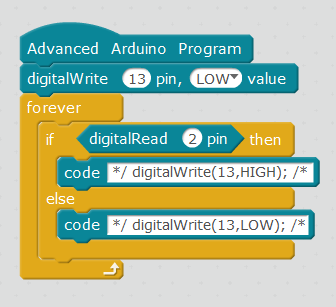 Mind that the mBlock automatically adds the pinMode () commands to the Arduino IDE sketch only when it encounters blocks like "digitalRead" and "digitalWrite" in the graphical script. Global and local variables, arrays and functions that return values. 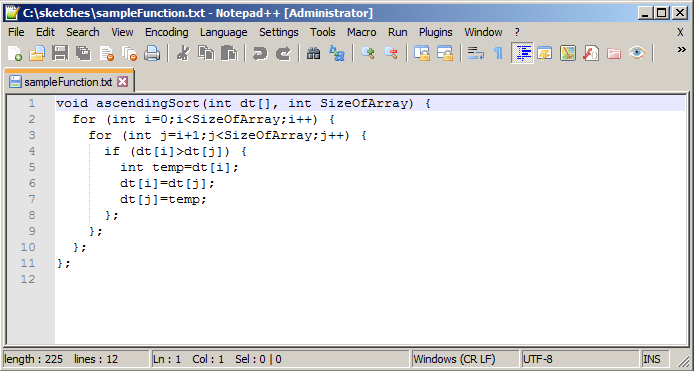 Note that the global variable "SizeOfArray" is of a double type, in this example, an explicit conversion of the value to another type is used: byte(SizeOfArray). The "line" addition of the custom code snippets. Note that in the text field of the first "Serial println" box, you need to enter the character <space> (ASCII 32), in this case mBlock adds the command Serial.println () to the Arduino IDE sketch. If there is an empty line inside the text field, the command Serial.println (0) is generated instead. Using the Wire code saved as a text file on the disk. The disk must contain a text file with the appropriate name and content. If it is necessary, change the path to this file in your script.